Thermography is the use of an infrared imaging camera to detect and measure thermal energy emitted from an object. This thermal energy, or infrared energy, is not part of the visible light spectrum that can be detected by the human eye. It’s the part of the electromagnetic spectrum that we perceive as heat. Every object emits infrared radiation. The higher the object’s temperature, the greater the IR radiation emitted. Infrared thermography cameras create images of this invisible infrared or "heat" radiation. 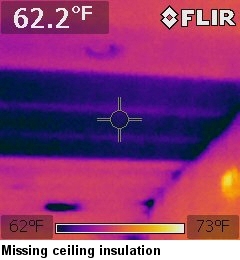 Infrared imaging helps find missing or poorly installed insulation. The temperature difference between insulated and uninsulated areas of exterior walls indicate the presence or absence of insulation. It takes training and experience to properly interpret infrared images. Knowledge of inside and outside temperatures, the presence of sunlight on exterior walls, the HVAC system blowing air onto the walls, and a thorough knowledge of the principles of thermodynamics all come into play when interpreting and image. Infrared imaging helps find water problems. When water evaporates it takes heat with it (that’s why we sweat – the evaporating moisture makes us cooler). 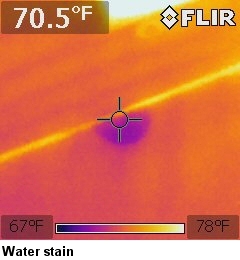 The wet area then shows up colder in the infrared image. Again, it takes training and experience – and often further investigation – to properly interpret an infrared image that shows a cold spot. Someone forgot some of the insulation at this ceiling (left image). On the right, we see a water spot up high on the wall. There's no good way to discover a problem high up like this except with infrared imaging. Infrared imaging can be used for other applications as well, such as finding dangerous overheating in electrical systems. 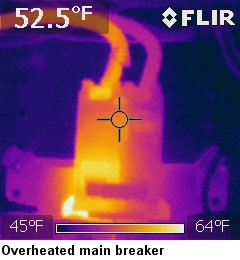 In this image below the main electrical breaker is overheating on the left side. This is unsafe, and an electrician needs to make repairs. Just as x–rays opened up a whole new dimension to medical diagnoses, infrared cameras open up a whole new dimension to finding and diagnosing problems with homes.